Buying a diamond can be an overwhelming task. The carat weight, color grade, clarity grade, and cut of a diamond work collectively to determine its price. The cut - or overall appearance - of the diamond is very important because it determines the brilliance and fire the diamond displays. 'Ideal' cut is a term you'll probably hear mentioned when you shop for a round brilliant cut diamond, so it's important to understand everything about this cut to make sure a jeweler offers you the real deal. Cut is crucial because it unleashes the fire and brilliance for which the diamond is famous and unrivaled in the gem world. Cut comprises the shape, the polish, and the symmetry of a diamond. 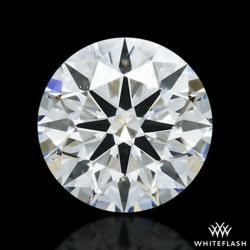 However, cut is not the only factor to consider when evaluating ideal cut diamonds. Shape is the face-up outline of the diamond. The round brilliant cut is considered the ideal shape to achieve maximum brilliance from a diamond. Polish is the condition of the diamond's surface as a result of the polishing process, and it pertains to how flat and smooth it is. Symmetry refers to how exact the shape of each facet (flat surface) is, as well as the proportions of all the facets to each other and to the diamond overall. In 1919, diamond cutter and engineering student Marcel Tolkowsky published his PhD dissertation on diamond cutting. The dissertation included calculations on how to achieve maximum brilliance and dispersion from a diamond and guidelines on cutting to achieve it. This 'Tolkowsky cut' took the diamond world by storm. The calculations became even more specific over the years, and the term 'ideal cut' became the norm. 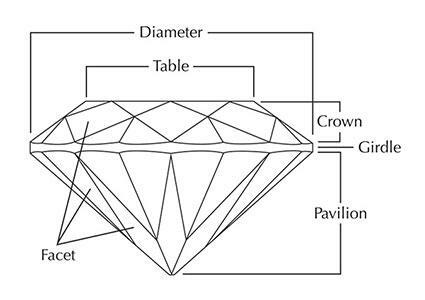 Keep in mind that 'ideal cut' can be a generic term used to describe a diamond that meets these proportion calculations without regard to the diamond's polish. Cut can be measured using a laser-measuring machine, a common one is manufactured by Sarin. However, the machine does not assign a polish grade. If your jeweler has a machine, ask for the diamond to be measured. If the diamond is touted as being ideal, the diamond will assuredly have a report to accompany it. Ask to see the diamond report and review the diamond's measurements. The two major diamond reports to consider when shopping for ideal cut diamonds are reports from the American Gem Society Laboratory and the Gemological Institute of America. The American Gem Society (AGS) Laboratory was founded in 1996 to supply the public with diamond reports that assigned numeric cut grades to diamonds, in addition to color and clarity grades and weight assessments. The AGS believes so firmly in the superiority of the ideal cut over any other diamond's dimensions that they branded the term 'AGS Ideal Cut'. This label is given to a diamond that meets the AGS ideal parameters on proportions and polish. 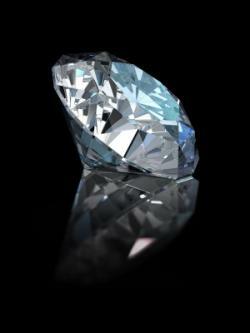 Ideal diamonds have a zero grade on the AGS cut grading scale, and AGS diamonds have a laser inscription on the girdle noting the accompanying report's number. An AGS zero cut diamond will display a hearts and arrows pattern when viewed through a special device called an Ideal scope (or something similar). When viewed face up, the facets display arrows circling the circumference; when viewed with the pavilion up, they display hearts encircling the pavilion. A diamond with an AGS report labeling it as an AGS Ideal (or AGS 0 or AGS Zero) is typically far more expensive than another diamond of the same carat weight, color, and clarity. The Gemological Institute of America (GIA) was established in 1931 and, in 1940, comprised the 4 C's of diamond grading: cut, color, clarity, and carat weight. This is the universal language of diamonds, understood by every diamond cutter, wholesaler, buyer, and retailer in the trade. A diamond with a GIA report showing ideal measurements and Excellent cut grade will be less expensive than a diamond of the same carat weight, color and clarity grade with an AGS report of depicting an AGS zero cut grade. 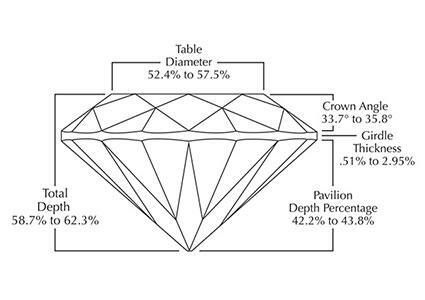 Keep in mind that retailers will call a diamond an ideal cut if the proportions match or if the diamond achieved an Excellent grade for polish and/or symmetry. These diamonds will only have a GIA report, and will be less expensive than a diamond whose proportions fit within the parameters, have Excellent polish, and Excellent symmetry backed up by an AGS grade. White Flash has AGS report diamonds guaranteed to display the hearts and arrows phenomenon, and they are available in varying carat weights, color, and clarity grades. A 1.027 carat diamond of H color grade and SI1 clarity grade sells for just over $7,900. This company also has numerous designer mountings available for a completed ring. Blue Nile has an extensive collection of ideal cuts in varying carat weights, color, and clarity grades. This company only has GIA reports accompanying their ideal cut diamonds, not AGS. Their ideal cuts have proportions that are very close to the AGS 0 cut, about one to two millimeters shy or about one degree difference, and they're almost impossible to differentiate with the naked eye. A 1.05 carat ideal cut with G color grade and SI1 clarity grade sells for just over $6,100. A 1.05 carat Signature Ideal Cut with G color grade and SI1 clarity grade sells for just under $7,750. Signature Ideal Cut rings each have a GIA report showing Excellent polish and symmetry. Mountings are available in 14k and 18k gold and platinum. While cutters and sellers believe they have achieved the exact calculations to achieve the maximum fire power of a diamond, what a calculation really reflects is beauty. As with anything, diamonds included, beauty is in the eye of the beholder. Weight, color, clarity, and cut are very important considerations when pricing diamonds. However, no one wears an engagement ring with a diamond report taped to it. A diamond that is loved, regardless of the report, will always be the right diamond.